You may look at this list of ingredients and be a little shocked! Moles, meaning sauce, traditionally have at least 20 different ingredients on average and are a source of great pride. 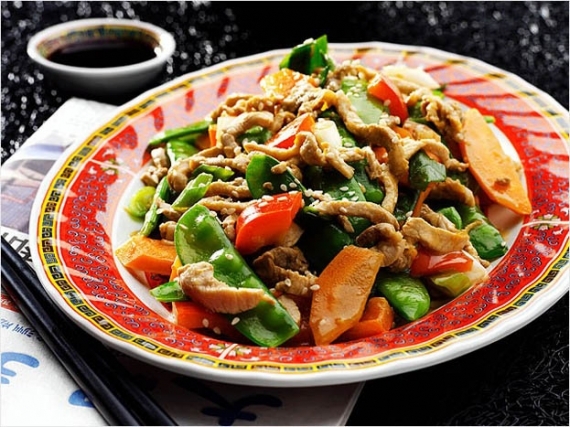 They usually involved several different types of peppers, dried fruits, nuts and a hint of chocolate. This version is a bit of a dumbed down one, as it only contains 12 (chicken and garnish not included)! 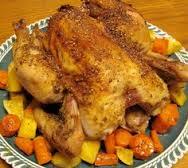 If you don’t have a rotisserie chicken, you can poach or roast off the equivalent amount of chicken yourself. Place a pot over medium heat and coat with the oil. Add the onion and garlic, stirring to soften for 5 minutes. 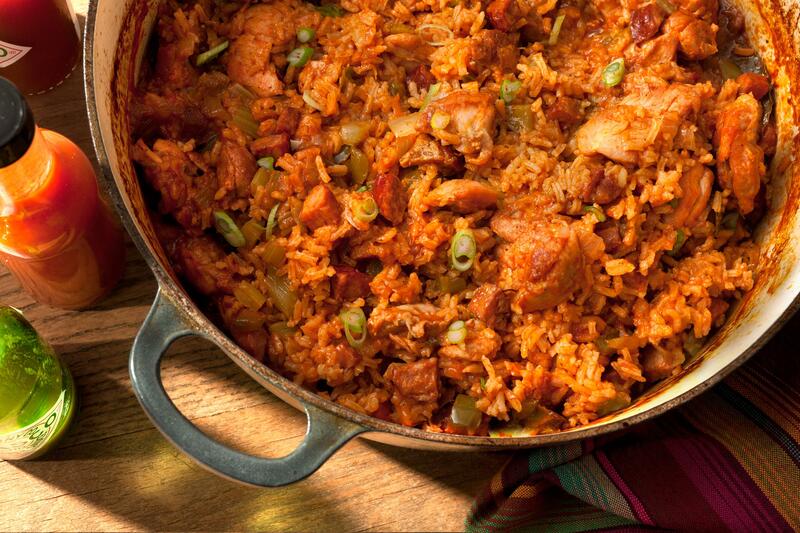 Add the chipotle with adobo, raisins, and tomatoes, stirring to combine. Bring to a simmer and cook for 10 minutes. Carefully pour the mixture into a blender. Add the peanut butter, broth, chili powder, and cinnamon. Puree the mixture until smooth. Season with salt and pepper. Return the mixture to the pot over medium heat. Cook for 15 minutes, stirring occasionally. Add the chocolate and stir until melted. Add the shredded chicken and heat through. 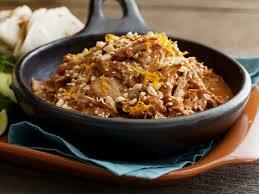 Transfer the mole to a serving dish and garnish with peanuts, sesame seeds, and orange zest. Serve with cilantro, lime, avocado, and tortillas. Heat a large saucepan over medium heat adding a little olive oil. Season chicken with salt and pepper, and brown in the saucepan until almost cooked through. Remove chicken from pan and set aside. Sauté the onion, garlic, carrots and celery in same pan. When tender, stir in ginger, paprika, cumin, oregano, cayenne pepper and turmeric; stir fry for about 1 minute, then mix in broth and tomatoes. Return chicken to pan, reduce heat to low and simmer for about 10 minutes. Add chickpeas and zucchini to pan and bring to a simmer once again; cover pan and cook for about 15 minutes, or until zucchini is cooked through and tender. 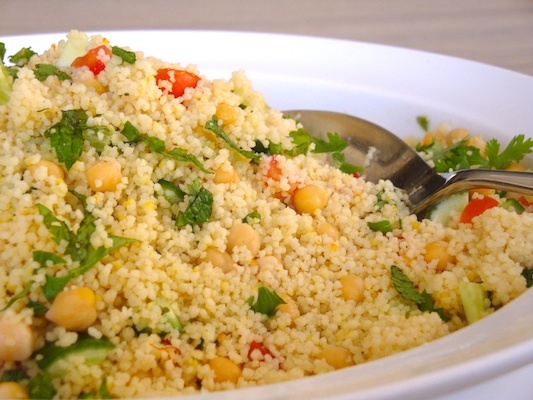 Stir in lemon juice and serve over the rice, plain couscous or the delicious couscous recipe below. Place a large, heavy bottomed pot over medium heat. Stir in the cumin, ginger, cloves, cayenne, cardamom, coriander, and allspice; gently toast until fragrant, about 2 to 3 minutes. Stir in oil and onion, cook until softened. Stir in the bell pepper, and zucchini; cook for 5 minutes. Stir in the raisins, salt, zest, and garbanzos. Pour in the chicken broth and orange juice; turn heat to high and bring to a boil. 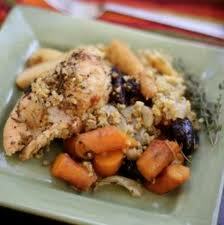 When the mixture is boiling, stir in the couscous and remove from heat; cover, and let stand 5 minutes. Fluff with a fork, and fold in chopped mint. *To learn how to inspect fresh mint, click here. 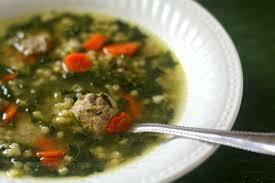 The recipe for this soup was passed around the office with rave reviews! It was originally published in the Toronto Star many moons ago, but has since become a staple in many of the houses of my co-workers. 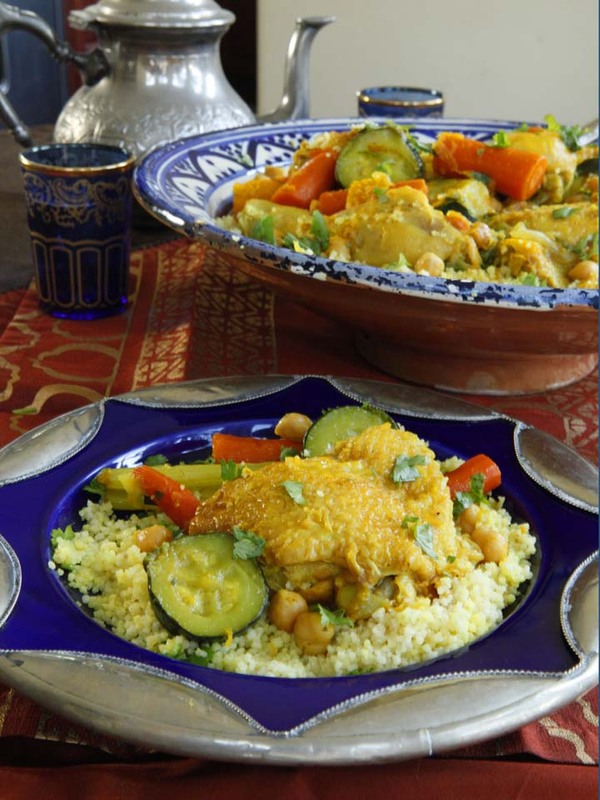 When they heard I was doing a Moroccan Week, it became a no brainer that I include this recipe! I hope you all enjoy! In a large pot, heat oil over a medium-high heat. Add onions, garlic and ginger. Cook, stirring every 3-5 minutes, until the onion has softened, but has not browned. Stir in the paprika, turmeric, cayenne and cinnamon. Cook, stirring constantly for 1 minute. Stir in the lentils, and mix until they are well coated. Stir in 5 cups of stock, tomatoes, salt, pepper and the bay leaf. Raise the heat to high, and bring the soup to a boil. 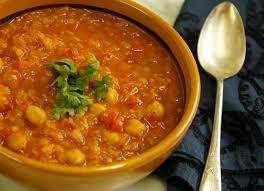 Reduce the heat to low and let simmer, covered, for 30-40 minutes. Add the remaining cup of stock and stir in the chickpeas, parsley and lemon juice. Simmer uncovered for a minute or so. Discard the bay leaf and cinnamon stick. 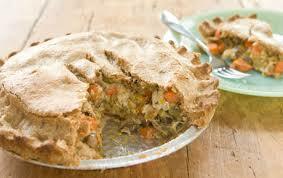 Adjust the flavour as desired, adding more salt, pepper or lemon, then serve hot. Enjoy! In a large pot over medium heat, poach the chicken in the chicken broth. Once cooked through, remove the chicken from the broth, and set aside to allow it to become cool enough to handle. Strain the chicken broth to remove any impurities that may have accumulated while poaching the chicken. In a large stock pot or Dutch oven (can be the same one you poached the chicken in), add 1 teaspoon of olive oil and bring to a medium-high heat. Add the onions and sauté until they become translucent, about 4-5 minutes. Add the garlic, chili powder and cumin and mix well, allowing the spices to become fragrant. 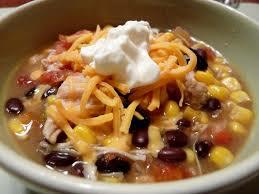 Then add the broth, corn, beans, lime juice, and salsa. Reduce heat to low and simmer for about 20 minutes. While the broth simmers, take the chicken that you have set aside, and using two forks, or your hands, shred the chicken. Add the chicken to the soup and let it simmer for an additional 10-15 minutes. While the broth mixture simmers, heat the remaining 2 tablespoons olive oil in a skillet. Fry the tortilla strips in the hot oil until crisp. Remove from skillet and drain on paper towels. Place half of the tortilla strips in the bottom of each bowl, and then serve the soup hot with the remaining tortilla strips on top, along with the options of the cheese and sour cream. Serves 8. I got this recipe from my sister Ellie. She is an excellent chef in her own right and a much better baker than me! Preheat the oven to 400 degrees. Remove the giblets and any fat from the chicken cavity. Roll the lemons on the counter with your hand to soften, then prick with a fork, going all the way through the rind of the flesh. Cut one of the lemons in half. In a small bowl, mash the garlic with 1 ½ teaspoons of the salt until a paste forms. Rub half this paste inside the chicken and then stuff one and one half of the lemons into the cavity. Add 3 tablespoons of the oil to the rest of the garlic paste and rub the mixture on the outside of the chicken. Place the cut up vegetables in a roasting pan, tossing with the remaining salt and oil, and form a make-shift rack for the chicken to rest on. Place the chicken on top of the vegetables and pour the broth into the bottom of the pan. Squeeze the juice from the lemon half into the broth. Roast for 60-65 minutes, basting with the pan juices halfway through the cooking time, until a meat thermometer inserted into the thickest part of the thigh registers 180 degrees Fahrenheit, juices run clear when pricked with a fork, and the drumstick moves easily in its socket. Cover the chicken and let rest for 10 minutes before carving. Serve with the pan juices.